From the last month, we had seen a few Indian mobile manufacturer are competing with each other specially with the quad-core based phablet devices. After the success of Micromax A116 Canvas HD, we have seen many other companies like lava and Intex have also launched Mobile with Quad Core processor and now its the turn of Zen to join this competition. Earlier we have seen Micromax A116 Canvas HD, Lava Xolo B700, Intex Aqua Style 2, were featured with Quad Processor and now Zen Ultraphone 701 HD also joins this list. The device has got many similarities with Micromax A116 Canvas HD mobile and hence it is seen as the another rival to Micromax A116 Canvas HD, from another domestic handset maker. This Ultraphone from Zen share few same feature with MicromaX mainly the 1.2 GHz processor where Zen got the Mediatek processore and Micrommax will feature Cortex A7 architectured processor .Both feature a display size of 5 inch and comes with 4GB of internal storage expandable upto 32. Both the device got 8Mp rear camera with auto focus and a LED flash but the secondary camera of 3.2MP is a surprising one in Zen Ultraphone 701 HD. The battery also is almost same with 2100mAH in Micromax Canvas and 2000mAH in Zen’s 701 HD. So the competition will be interesting between this device. It is a dual-SIM (GSM + GSM) smartphone that comes with a 5-inch display offering a HD resolution of 720×1280 pixels (308 ppi). 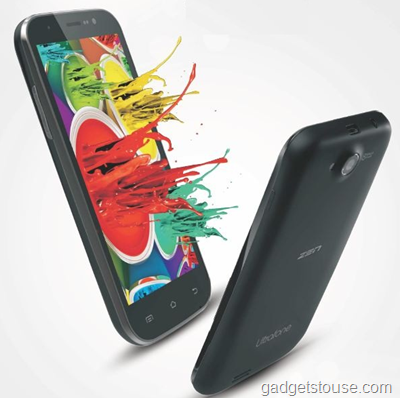 The Phone is powered by a 1.2 GHz quad core processor with 1GB of RAM. Processor chip is manufactured by MTK so the expected is performance result is good as it can delivers nice power but will underperform if you compare it with snapdragon processor chips. It comes with a 4GB of internal memory which can be expanded by an external storage up to 32GB using the micro SD cards. The Device will operate an Android Jelly Bean 4.2 which will be coming with the Google Play store. This smartphone, Ultrafone 701 HD, supports dual-SIM, of which one supports 3G, while the other can operate in 2G mode. The device is featured with an 8 MP rear snapper with BSI and LED flash, and got a surprising 3.2 MP front camera to take care of video calling. The device supports Full HD video recording capability at 30fps rate, panorama shot, and burst shot with up to 99 shots on the go. The device support basic Connectivity options which include 3G, EDGE, WCDMA, GPRS, Wi-Fi a/b/g/n, A-GPS, Bluetooth v4.0 with ADP and microUSB and comes along with the preloaded apps like Facebook, Twitter, Youtube, WhatsApp, GTalk, Zen Mini Store, Skype, MX Player, Contact Plus, Flash Light, Emoze, TOI, Saavn.It will get a power of 2000mAh battery, which could promise you to give 8 hours of talktime. Processor: 1.2 GHz Quad-core MediaTek MT6589 processor. Software Version: Android 4.2 (Jelly Bean). Connectivity: 3G, EDGE, WCDMA, GPRS, Wi-Fi a/b/g/n, A-GPS, Bluetooth v4.0 with ADP and microUSB. The handset with this technical specification, looks good for the price tag of Rs.11,999, notably with the quad-core CPU complemented by 1 GB of RAM. It look like a good option for those who are on a budget and not very much bother about the brand name. Its competitor ,Micromax A116 Canvas HD with the same specs, costing Rs 4000 more so this device becomes more attractive with this price tag. This mobile is made available online at Snapdeal. Free goodies like Flip Cover, White Back Cover and Screen Guard were also offered by Snapdeal for those purchased the mobile on pre orders. If you are not brand cautious, you can purchase this mobile as alternative for Micromax A116 Canvas HD mobile. THE GOOD : Decent Specs at a good price. Fast performance. No freeze/hands experienced. Almost stock android experience, with very little bloatware installed by manufacturer. Wifi connects quickly and signal reception was strong, as measured by Wifi Analyzer. THE BAD : Poor build quality. Screen had marks (air bubbles between the glass and the internal screen. The screen also had defective pixels, causing a red line to run vertically across the screen, and it was increasing day by day. The volume rocker button also conked off. feels thick and heavy, but it is a large phone. Back has a very smooth feel, feels like it will slip. But may appeal to some people. Colors look a bit faded, but i may be baised as i am used to the S2’s amoled display. THE UGLY : Snapdeal Replacement process. I immediately placed a complain to snapdeal regarding the defects. I had to make 2 trips to the Zen mobile service centre to an obscure place in Delhi(i live in gurgaon and there is no service center there). I got an authorization for replacement of phone from them. I am now waiting for snapdeal to pick it back up. They are not committing to any time frame for replacement or refund. Had i bought it from my local retailer, i would have checked the piece there itself and got a non defective piece. Or they would have given be a new handset over the counter. Here i am, after more than 2 weeks of payment, with a non functional phone(the zen mobile people have sealed back the phone, to be picked up from my residence by Snapdeal). The whole idea for online shopping is that i shop from home and the retailer does not have to manage a showroom. Here i have to make two trips of 65 kms each, spend hours and atleast 1000 rupees in petrol, toll and parking, while snapdeal makes a nice profit on me. Suggest you buy it at a retail store and check the piece for quality before buying. Since there was a manufacturing defect, notified immediately to snapdeal, they should have despatched a replacement, no questions asked. Sadly, this was not the case. I m totaly agree with you sir my phone also had a red line on screen after 20 days of purchasing n service center says this problem is not under warenty terms and condition i pay 400rs for phone repairing…..
Hi ! I bought it yesterday, and till date I don’t have a single problem. Its one of the best device IMHO under 12k. I bought this piece from Snapdeal. from minute 1, the problem started. The phone is not able to detect the SIM. The main use of the phone fails. now running behind service center. Return process etc. Ultimately, i feel, i lost 12,000. Please better turn away from snapdeal rather this phone. Dea sir, can u plz conform that Zenultarphone 701HD support Document viewer ? yes it supports the document viewer app or other similar apps. Dear sir, can u plz conform that Zenultarphone 701HD support Document viewer ? I HAD THE SAME PROBLEM WITH SNAPDEAL WHEN I BOUGHT A PHONE FROM THEM. TO THE SERVICE CENTER WHICH WAS NOT NEAR MY PLACE. THEN THEY TELL ME TO SEND THE PIECE BACK. AND AFTER DOING THAT I AGAIN RECEIVE A DEFECTIVE PIECE. AGAIN I WAS ASKED TO SEND IT. AGAIN I SEND THE MOBILE BACK, THE THIRD TIME I THOUGHT I WOULD RECEIVE A GOOD PIECE BUT IT WAS THE SAME STORY. IN THE END I JUST TOOK THE MOBILE AND THREW IT OFF. SO FEDUP WAS I WITH THE SERVICE. EVEN AFTER WAITING FOR TWO MONTHS I COULD NOT RECEIVE A GOOD PRODUCT. NEVER BUY FROM SNAPDEAL IF YOU DONT WANT TO WASTE YOUR MONEY. we will let you know about it soon, if you get the info share with us.